NEW DELHI: How many of you are aware of the fact that it has been 100 years since the first one rupee (Re 1) note was issued. It has been quite a journey for this humble note through the last century. 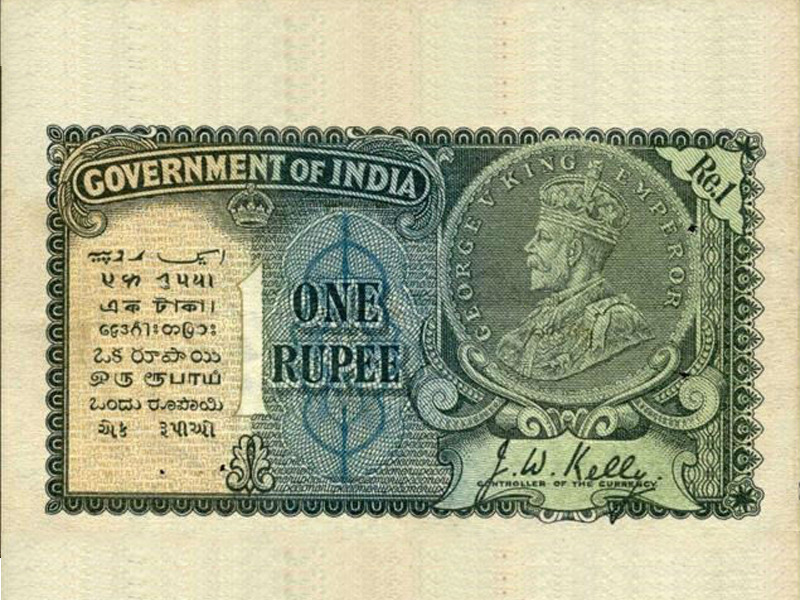 The first Re 1 note was introduced on this day in 1917 but it was not printed in India. The printing was done in England and it depicted a silver coin image of King George V on the left corner. It included the words "I promise to pay the bearer the sum of One Rupee on demand at any office of issue" were embossed upon it. 1. 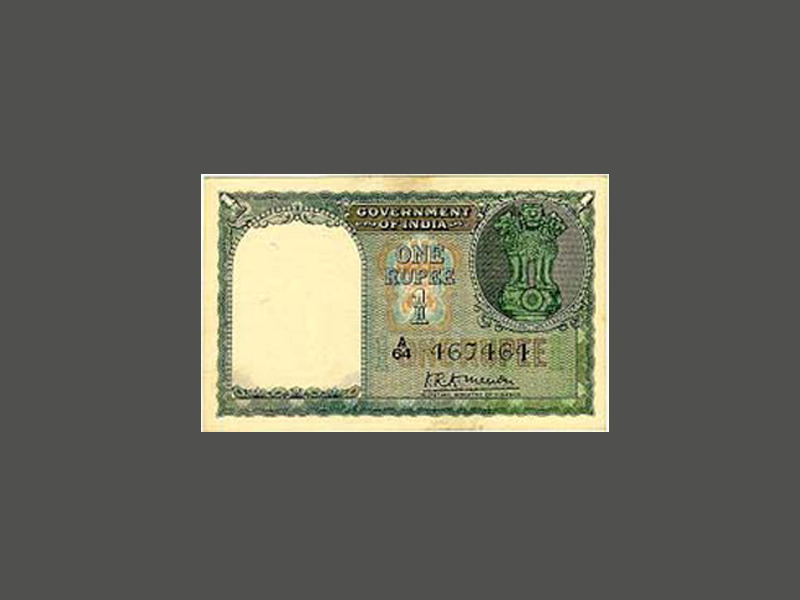 Government of India brought out the new design Re 1 note in 1949. The King's portrait was replaced by the Lion Capital at Sarnath. Although, the new design of notes were largely along earlier lines, Reserve Bank of India (RBI) said. 2. Until 1970, this note was also used as currency in Persian and Gulf countries such as Dubai, Bahrain, Muscat and Oman. The Portuguese and French were so impressed by the Indian note that they also issued their own one rupee note. 3. 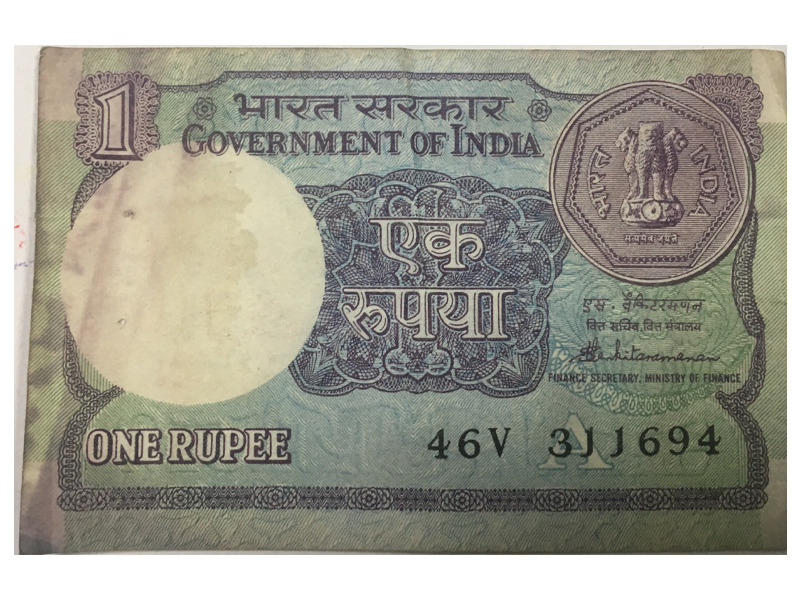 The printing of Re 1 notes was discontinued in 1994 because of high printing cost. The cost of printing Re 1 notes in 1994-95 was Rs 1.48 a note and when reintroduced, the cost came down to Rs 1.14 and now it has gone below its nomination value to 78.5 paise. 4. 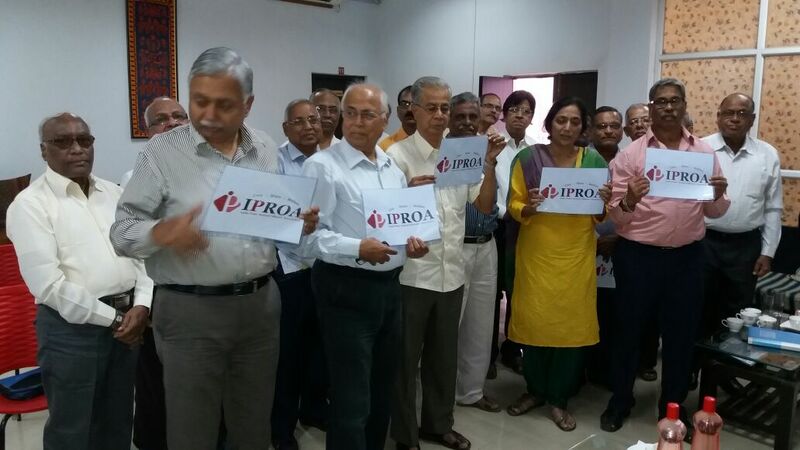 The notes are printed by the government-owned Security Printing and Minting Corporation of India (SPMCIL). The cost of printing Re 1 notes has come down from Rs 1.14 per unit to 78.5 paise due to better use of technology. 5. One of the most important facts is that, the Re 1 note bears the signature of the finance secretary not the RBI governor, for it belongs to the Republic of India, not the central bank. The colour of new Re 1 note is predominantly pink green on obverse and reverse in combination with others. On the reverse side, the surrounding design consists of the picture of 'Sagar Samrat' - the oil exploration platform. CHENNAI: The Madras High Court has directed the State government to issue guidelines on the ‘determination of the community’ and ‘reservation in employment’ in respect of transgenders to streamline the procedures to be followed by its agencies in selecting them for appointment in its services. Justice N Kirubakaran gave the direction while disposing of a writ petition from Tharika Banu (27), a transgender, praying for a direction to the secretary, Directorate of Indian Medicine and Homeopathy to allot one seat in the Bachelor of Siddha Medicine and Surgery course in the College of Indian Medicine and Homeopathy for 2017-18. The judge also directed the authorities to allot one seat to the petitioner. “Transgenders are shunned by their families. Harassment, assault, violence, especially sexual violence, denial of basic civil rights, denial of access to public places are part of their life. They are being looked down by the society as “sinners”. Due to the unfair treatment, they are socially excluded and struggling without any dignity. Therefore, helping hands should be extended by all, especially by the government,” the judge said and hoped that this order would be a first step to throw open doors of educational institutions for the entry of ‘transgenders’ for their social empowerment, employment status, dignity and right, which have been denied to them till date, violating the fundamental rights guaranteed under Articles 14 and 21 of the Constitution. The petitioner’s claim for admission to the BSMS course cannot be denied on the ground that she has not obtained the minimum marks of 50 per cent. This minimum marks holds good only for ‘males’ and ‘females’. In the prospectus, it has not been spoken about transwoman or transgender. “Therefore, leniency should be shown to the transgender person, who is longing for an admission into the Siddha college. Therefore, the minimum marks applicable to the male and female students cannot be made applicable to the transgenders.The authorities are guilty of not implementing the orders of the Supreme Court and this court, by not providing a separate reservation for them,” the judge said. The judge added that it is not as if many transgenders have applied for seats. Only on very rare occasions, this kind of claim would be made and that has to be considered with compassion. The course commenced from November 1 last. To avoid lapse of the one seat already reserved for the petitioner, it is appropriate to direct the authorities concerned to admit the petitioner in the course, immediately within a week, which the petitioner is entitled to. Moving to make instant triple talaq or talaq-e-biddat a criminal offence, the government is considering, among changes in existing laws, amendments to The Muslim Women (Protection of Rights on Divorce) Act, 1986. Commonly known as the Shah Bano Act, the 1986 law was enacted by the Rajiv Gandhi government under pressure from the Muslim clergy to overturn the Supreme Court ruling in the Shah Bano case. This law allowed, in line with Muslim personal law, maintenance to a divorced woman only during the period of iddat, or three menstrual cycles/three lunar months after divorce. Officials said that changes to The Muslim Women (Protection of Rights on Divorce) Act, 1986 was “one of the options discussed” and a final decision would be taken by a Group of Ministers (GoM) constituted to draft a law to make triple talaq a criminal offence. According to officials, the ‘preamble’ of the Shah Bano Act will have to be re-drafted since the existing law applies only after the divorce of a Muslim woman. In August this year, the Supreme Court declared talaq-e-biddat as illegal. The draft legislation being enacted by the Law and Home ministries, officials said, will not only criminalise instant triple talaq but will also have provisions for imprisonment and fine or both for the offender. Other than changes to the Shah Bano Act, the government is considering amendments to provisions of Section 125 Code of Criminal Procedure (order for maintenance of wives, children and parents) to provide further safeguards to Muslim women and their wards if they are abandoned via instant triple talaq, the officials said. On August 22, the Supreme Court, in a landmark 3-2 verdict, “set aside” the centuries-old practice of instant triple talaq in which Muslim men divorce their wives by uttering talaq three times in quick succession. Three of the five judges on the Constitution Bench — Justices Rohinton F Nariman, Uday U Lalit and Kurian Joseph — called the practice un-Islamic and “arbitrary” and disagreed with the view that triple talaq was an integral part of religious practice. But the minority ruling of then Chief Justice J S Khehar and Justice S Abdul Nazeer underlined the primacy of Muslim personal law and said the practice enjoyed constitutional protection and was beyond the scope of judicial scrutiny. They were of the view that Parliament should consider an “appropriate” law to deal with the issue of talaq-e-biddat. While divorce is a civil matter, government sources pointed out that the legislature was free to declare any unlawful/illegal offence, in this case triple talaq, as criminal. A senior government functionary said ‘non-maintenance of wife and children’ after triple talaq, declared illegal, can be legislated to invite penal provisions. The move to consider amendments to the Shah Bano Act offers powerful political optics for the ruling BJP, which has been advocating a Uniform Civil Code. he Shah Bano Act was enacted by the Rajiv Gandhi-led Congress government to overturn a Supreme Court order that sought to provide parity to Muslim women in maintenance after divorce. The law was brought in after strong protests from the Muslim clergy who said the Supreme Court order amounted to interference in their personal laws. Once the law outlawing triple talaq is enacted, the Muslim clergy, government sources said, will have no role in cases of talaq-e-biddat and women can directly approach police for redressal. The ministerial committee, after its first meeting, felt that laws related to marriage like the Domestic Violence Act and the Dowry Act were prone to misuse and safeguards would be required in the new legislation. The Centre has decided to withdraw its controversial plan of notifying a ban on sale of cattle for slaughter in animal markets, a senior official from the Ministry of Environment and Forests told The Indian Express. The move comes after the Ministry sought feedback from states on its May 23 notification on changes made to the Prevention of Cruelty to Animals (Regulation of Livestock Market) Rules, 2017. “We sent a file to the Ministry of Law earlier this week, stating that we are withdrawing the notification due to several issues and will be revising it,” the official said, adding that a time-frame for the process has not yet been decided. After the notification in May, the BJP-led NDA government came under severe criticism for attempting to impose the nationwide ban on ideological grounds. Subsequently, several instances of harassment and assault by cow-protection groups were reported from various parts of the country. Farmers, too, opposed the move to restrict trade in markets only to animals meant for agricultural use, saying they cannot directly access slaughterhouses. Farmers normally bring their redundant animals to livestock markets from where traders purchase and transport the cattle to abattoirs. In September, Environment Minister Harsh Vardhan indicated for the first time that the Centre may lift the ban. At the time, he said the rules were a “regulatory regime” for preventing cruelty to animals and the government “did not intend to directly or indirectly affect slaughterhouses or harm farmers” or “influence the food habits of people”. It was then that the Ministry asked states to send their opinion on the notification that prohibited the sale of cattle for slaughter at animal markets. The Ministry had sent two sets of letters to states — the first was soon after the Supreme Court stayed the ban — reminding them to respond. It had also attached a copy of the notification and said that a new draft would be framed based on feedback. The Ministry also held consultations with animal rights activists and traders on the issue. The government’s decision in May had sparked outrage, notably from states such as Kerala, West Bengal and Meghalaya on the grounds that it related to an issue under their jurisdiction. In May-end, the Madras High Court granted an interim stay on the implementation of the rules, specifically Rule 22(b)(iii) that required a person bringing cattle for sale to the market to furnish a written declaration that it would not be sold for slaughter. In July, the Supreme Court extended the stay to the entire country. GDS ar deprived of the State Government welfare/ pension schemes which are available to common man, as the State Govt. consider the working/ discharged GDS as Central Govt.employee and reject their application on this ground. There are several schemes launched by the Central & State Govt. for housing , health , emoyment etc. But the benefits of these programmes are not reaching to GDS and their family members because of their projected status as a Govt.employee. For example in Andhra Pradesh & Telangana States , GDS are not eligible for issuing White Ration Card , medical re-embursement schemes like Aarogyasri & NTR Vaidhya Bheema , Housing schemes , childrens educational fee re-embursement , Old age pension etc. which were provided to all COMMON MAN living in these both States. Therefore we are in the view , that the Central and State Governments not treated GDS as a COMMON MAN also. The GDS are not covered under CCS (Pension ) Rules,1972 and therefore , they are not entitled for any pension,GPF and other benefits . So, DoP has sympathytically designed some social security schemes to GDS i.e. Sevarance now called as Service Dischage Benefit Scheme (SDBS) ,Gratuity,Group Insurance etc. 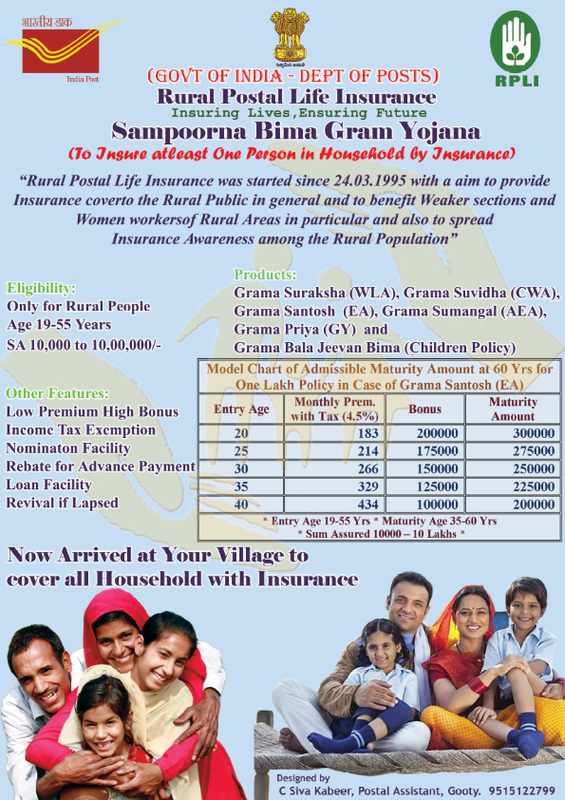 At present insurance coverage of Rs.50,000 with a monthly subscription of Rs.50 is available to all GDS. But it is not a attractive scheme when compared to PMJJBY. In the above said two schemes , the GDS Committee recommended 1.5 Lakh to Sevarence amount with delinking the SDBS and 5 Lakhs to Gratuity.GIS recommended for 5 Lakhs with a monthly subscription of Rs.500. 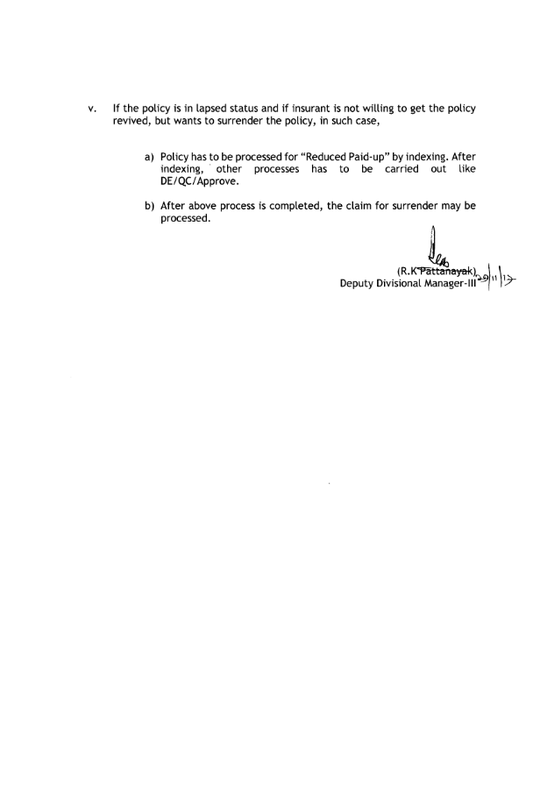 But according to latest information, Severance & gratuity schemes are recommended @1.5 Lakh by the Greatest Departmental Committee who knows everything about GDS System and also who are enjoying on the slavery deaths of GDS.No change of insurance coverage of Rs.50,000 in case of GDS GIS. But, not with in the four walls of the AC ROOM according to Department wish. 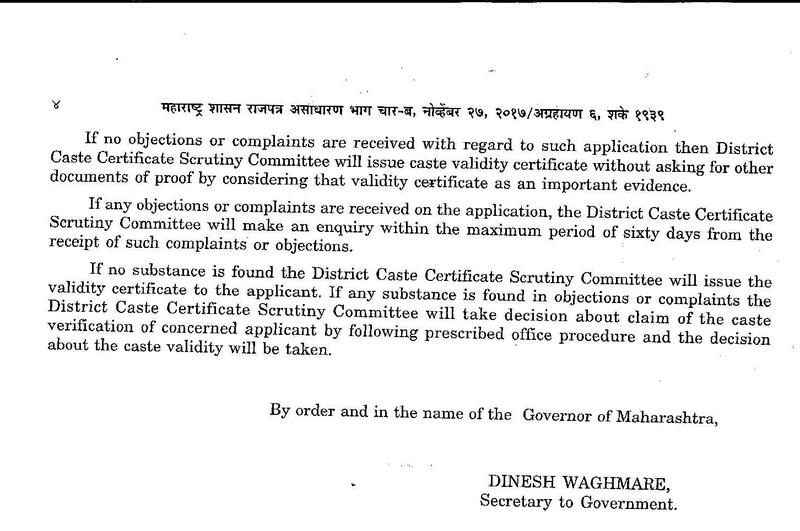 PROCEDURE FOR OBTAINING CASTE CERTIFICATE FROM COMPETENT AUTHORITY - MAHARASHTRA STATE. NEW DELHI: Indian Railways today unveiled its new ‘Swarna’ coaches of the Rajdhani Express with facilities such as ‘auto janitor’ system in toilets and LED lighting. This is part of the railways’ efforts to overhaul old and damaged coaches of all trains, starting with premium trains. The features include complete painting of the interiors to an aesthetic international colour scheme and LED lighting to improve illumination. These coaches also have ‘auto janitor’ system in toilets, faucets, stainless steel washbasins, improved soap dispensers, better quality dustbins and carefully chosen locations for ergonomic convenience. The train has also been fitted with night signage for easy identifications of berths. It also has built-in ladders for First AC passengers for easy access to upper berths, CCTV cameras in doorway areas and aisles to monitor any suspect activity with data storage. The train, the first of its kind, also has improved features like newly-designed bags with extra pockets for mobiles, LED lighting over mirrors, vinyl wrapping of toilet doors for improved aesthetics, epoxy coating in toilets, provisioning of extra mats in toilets and polished commodes and basins to make them odour-free in every trip. This passenger initiative would be extended to another three trains of Howrah-New Delhi Rajdhani and two trains of Sealdah-New Delhi Rajdhani and the Howrah-Ranchi Shatabdi Express. Based on extensive research, the following features have been introduced by the ER on 1st prototype Rajdhani Rake which is also the first on Indian Railways. * Complete interior painting to an aesthetic International colour scheme and LED lighting to improve illumination. * Better hygiene by providing ‘auto janitor’ system in toilets. * Blanket covers for First AC passengers of two different colours to ensure separate cover in to and fro journey. A country wide advisory has been sent to all field formations of the Army and paramilitary forces warning of a cyber attack through mobile phones. Officials have been told to ensure that officers and men under their control delete certain apps created by Chinese companies or having Chinese links from their mobile phones, whether official or personal. The advisory comes in the wake of inputs received by the Union Home Ministry from agencies like the R&AW and NTRO. In fact, all personnel have been advised to immediately uninstall the app and format their cellphones. The apps dubbed as Chinese spyware includes TrueCaller, Weibo, WeChat, UC News, UC Browser and Baidu Maps. It isn’t immediately clear as to whether any agency has reported any case of espionage through the cyber route in recent days or even if these malware have compromised systems. But this isn’t the first time that red flags have been raised over defence forces being targeted by Chinese hackers. India faced its biggest cyber attack in 2012 when ITBP was compromised. The attack was tracked to North Korea. ITBP had been repeatedly warned of an impending cyber attack by NTRO and the matter was even taken up at the level f the PMO. ITBP’s positions, troop movement, bunkers and other critical information was reportedly leaked at that time. This time too, cyber security agencies have warned that ITBP is particularly vulnerable. A phishing attack, also in 2012, had compromised the SPG. Then Prime Minister Manmohan Singh’s travel plans to Bangkok in June had been leaked. 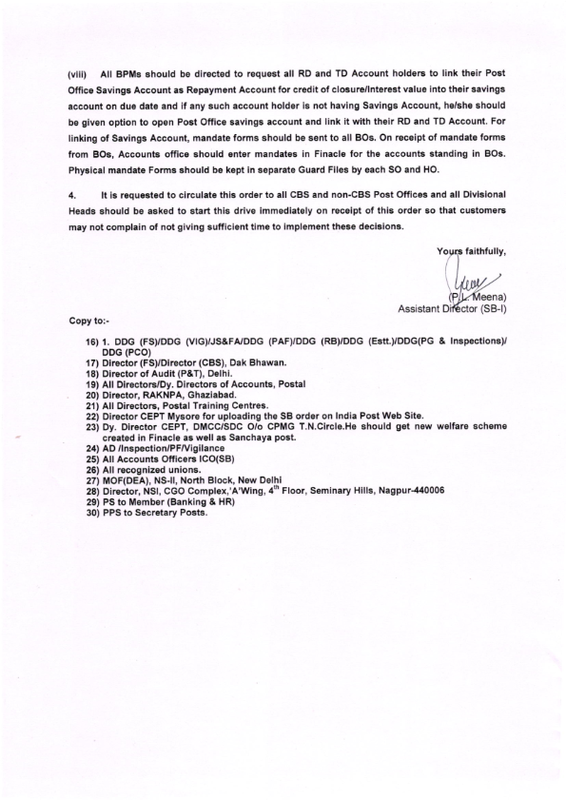 “The advanced security liaison had been compromised and the NTRO had pointed this out to the SPG in writing. The security breach which is considered extremely serious was hushed up because the SPG insisted they have been using stand alone or air gapped computers which are not connected to the internet,” say NTRO sources. The Army Design Bureau had last year red flagged Chinese circuitry in military hardware that could take military networks down. Instructions were sent out last year too advising against the use of Chinese origin smartphones. IN 2010, the Union Home Ministry had mulled whether Chinese companies like Huawei and ZTE could be banned in India. Amongst the many gadgets supplied by these firms, the Home Ministry had flagged modems as being particularly vulnerable. NEW DELHI: Stop giving contaminated water to passengers, the Delhi High Court told the Indian Railways today, and questioned its decision to hike fares when it was not providing better services. “Hundreds of thousands travel by trains and you are serving them contaminated water. Stop giving contaminated water to passengers. What enhanced services are you providing to increase fares?” a bench of Acting Chief Justice Gita Mittal and Justice C Hari Shankar asked. It directed that the matter be placed before the Railway Board Chairman who shall give a report on the quality of water made available to passengers. The report be placed before the Ministry of Railways, the court said and listed the matter for further hearing on February 19 next year. The bench said it wanted that the best and same treatment be given to every citizen. The bench said the issue assumes importance and deserved greatest attention and that it wanted the railways to examine it and take a decision on its own without the court getting into it. The court was hearing a plea by NGO Centre for Public Interest Litigation, which has sought “an independent and preferably court-monitored probe into the neglect of the quality of the drinking water supply and the manipulations in the award of contracts for supply of chlorination plants for past several years”. Advocates Prashant Bhushan and Govind Jee, appearing for the NGO, said the railways was neither adhering to the standards laid down for drinking water by the Bureau of Indian Standards nor following the Indian Railway Medical Manual. The lawyers said water being provided on stations and trains was not even being tested for presence of E.coli bacteria. The NGO has contended that while the Indian Railways, which has an independent water supply system all over the country, is able to keep trains running by meeting the requirement of water for washing and cleaning of trains, tracks and platforms, it is “failing to supply safe and wholesome drinking water to millions of railway passengers and its staff who live in the railway colonies”. विषय: Retention of General pool residential accommodation at last place of posting on transfer to a Non-family station. 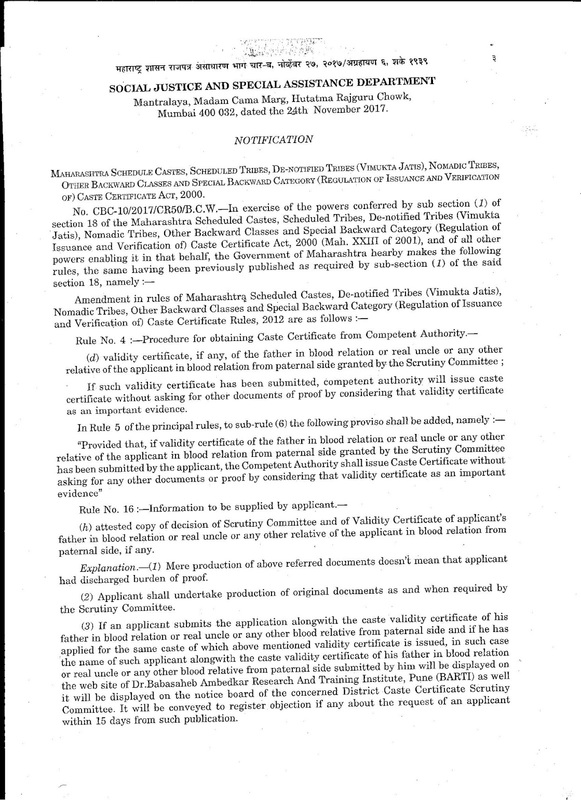 Reference is invited to the Rule 43 of the Central Government General Pool Residcntial Accommodation Rules, 2017, Vide which retention granted to allotteos (including AGMUT cadre officers) of GPRA at their last place of posting in case of their posting to different non-family stations for bonafide use of their family members under different guidelines of Government of India issued from time to time, lt has been restricted to a maximum of three years. But it has been observed that Allotment “sections are still allowing retention to such allottees as per the earlier guidelines/rules. 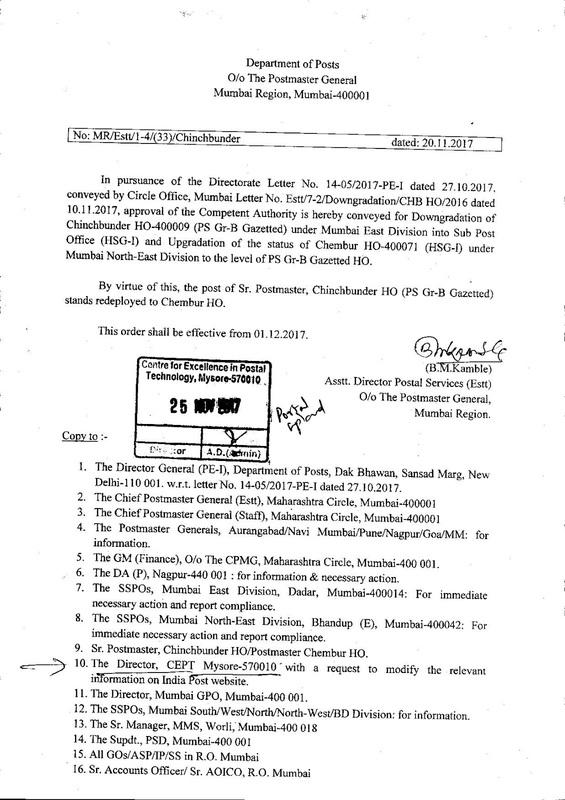 Therefore, it is requested to all allotment sections to strictly adhere to the new rules and retention shall be permissible as per these rules only. 2. 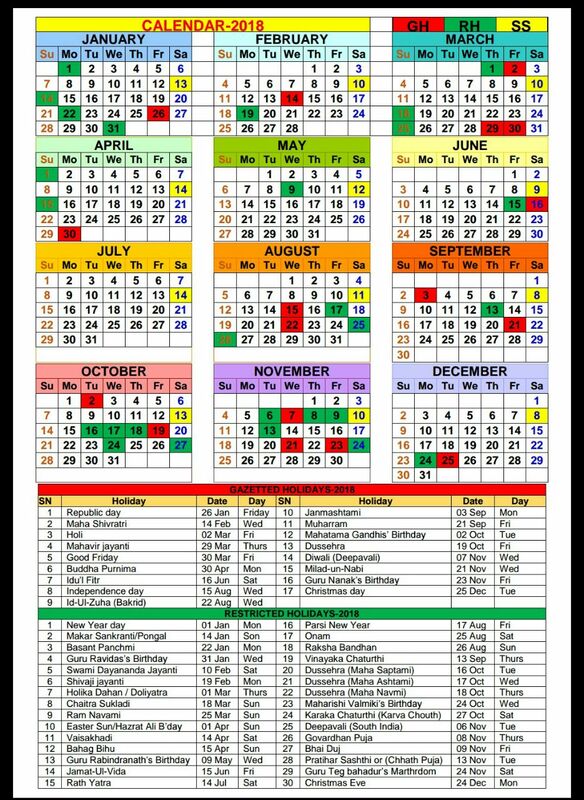 It may further be stated that w.e.f 19,06.2017, after the introduction of new rules i.e CGGPRA Rules, 2017, further retention should be granted to such allottees unto 30.06.2018 or maximum of 3 years, whichever is earlier. Recent media news pouring in on daily basis say, “Central Government Employees demands such as increase of minimum pay from Rs. 18,000 to Rs.26,000, multiplication factor from 2.57 to 3.7 etc would be considered in the 7th Pay Commission Anomaly Committee meeting to be held soon”. As per the agenda items in letter dated 16.08.2017 of Staff Side JCM, apart from cadre specific anomalies following comman anomalies have been discussed. 8. Lesser Pay in Higher level of Pay Matrix. 9. Bunching of Steps in the Revised Pay Structure. 11. Date of Effect of Allowances – HRA, Transport Allowance, CEA etc. However, DOPT has simply termed following 7th Pay Commission Common anomalies as not a Pay Anomaly at all. 5. Date of Effect of Allowances – HRA, Transport Allowance, CEA etc. 6. Anomaly in the grant of D.A instalment w.e.f 01.01.2016. It has been held by DOPT that the above agenda can not be called as anomalies as per DOPT OM No. 11/2/2016-JCA dated 16.08.2016 and 20.02.2017, notwithstanding the merit that they may have otherwise. It is to be noted here that it is a tactical approach of the Govt to declare 7th Pay Commission Common Anomalies detailed above as not an anomaly at all in order to close these issues and ensure that central government employees and pensioners are settled with 7th Pay Commission Pay, pension and allowances revision already granted by it. 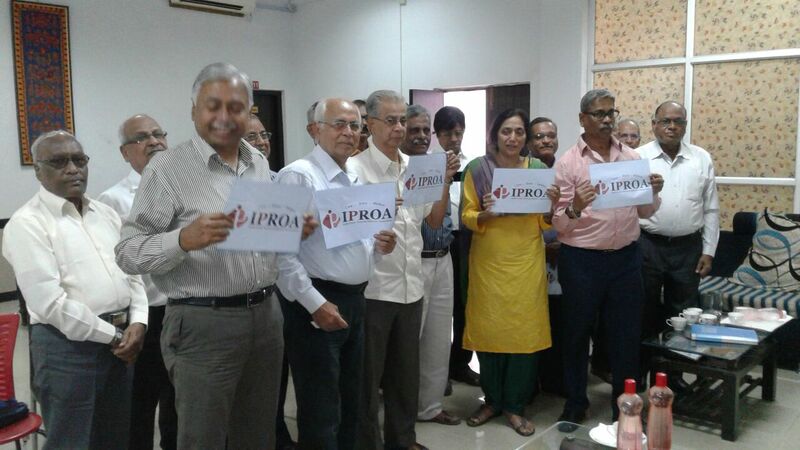 Now, it all remains in the hands of the all staff side Associations / Unions / Federations to fight back and ensure that Govt considers these 7th Pay Commission Common Anomalies and provide a favorable decision to Employees. 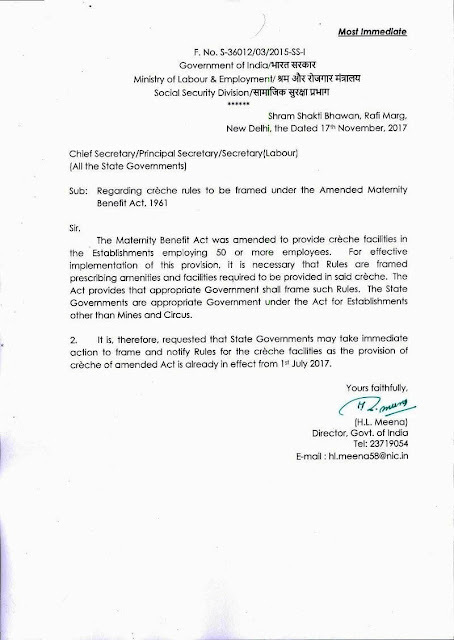 The Maternity Benefit Act was amended to provide creche facilities in the Establishments employing 50 or more employees. For effective implementation of this provision, it is necessary that Rules are framed prescribing amenities and facilities required to be provided in said creche. The Act provides that appropriate Government shall frame such Rules. The State Governments are appropriate Government under the Act for Establishments other than Mines and Circus. 2. lt is, therefore, requested that State Governments may take immediate action to frame and notify Rules for the creche facilities as the provision of creche of amended Act is already in effect from 1st July 2017. 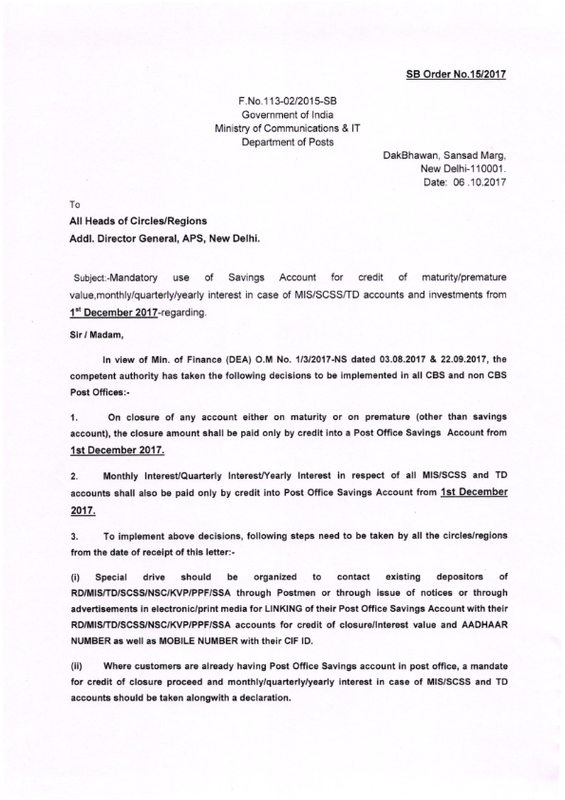 3.No Postmaster Cheque should be issued against any closed account/certificate and if any depositor attends post office for closing of any account not having linked SB Account by that date, a BASIC SAVINGS ACCOUNTshould be opened under this same ClF on the same day without asking for separate ACCOUNT OPENING FORM (AOF) by selecting SBBAS as scheme code. 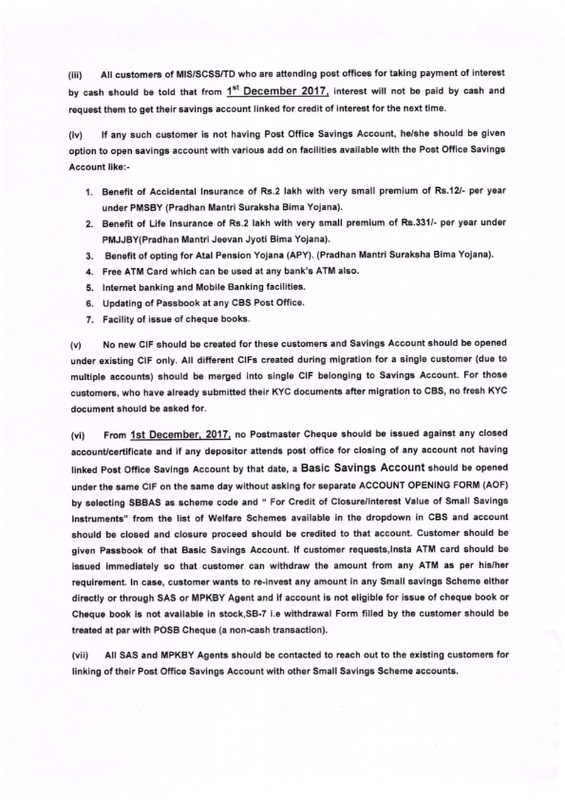 and account should be closed and closure proceed should be credited to that SB account. “We have faith in Prime Minister Narendra Modi. We are sure that he will try to keep a good industrial relation in the country and will fulfil our demands,” said one of the union member on the condition of anonymity. Earlier this week a Business Standard report said that there are slim chances of the government revising the minimum basic pay are true. The government staff unions have been demanding that their minimum pay is hiked to Rs 26,000 from Rs 18,000 that was defined on recommendations from 7th Central Pay Commission. A report quoted Finance Ministry sources stated that the government has no plans to make any changes to the minimum basic pay for central government employees with reference to the Department of Personnel and Training (DoPT) letter to Staff Side, National Council (JCM) dated October 30, 2017. The letter further stated that the minimum wage decided by the 7th Pay Commission does not qualify as an anomaly as per the parameters set by the National Anomaly Committee (NAC). The NAC had also laid down three conditions for an item to be considered an anomaly arising on account of recommendations from the 7th Pay Commission. Finance Minister Arun Jaitley had earlier suggested that a hike in minimum basic pay for central government employees was in offing. With NAC setting aside the matter completely, the Union Cabinet is unlike to take a decision on changing the minimum basic pay for central government employees either. Earlier this month several employee unions had also staged a three-day massive protest in front of the Parliament against the delay in minimum wage hike. The 7th Pay Commission had also decided on a fitment factor of 2.57 which resulted in the minimum basic pay increasing from Rs 7,000 to Rs 18,000 with effect from January 1, 2016. The NJCA on the other hand, have been demanding the fitment factor to be bumped up to 3.7 so that the minimum wages are raised to Rs 26,000. Expressing dissatisfaction over the methodology to calculate the minimum wages, the Staff Side had even asked for the pay matrix to be alerted. 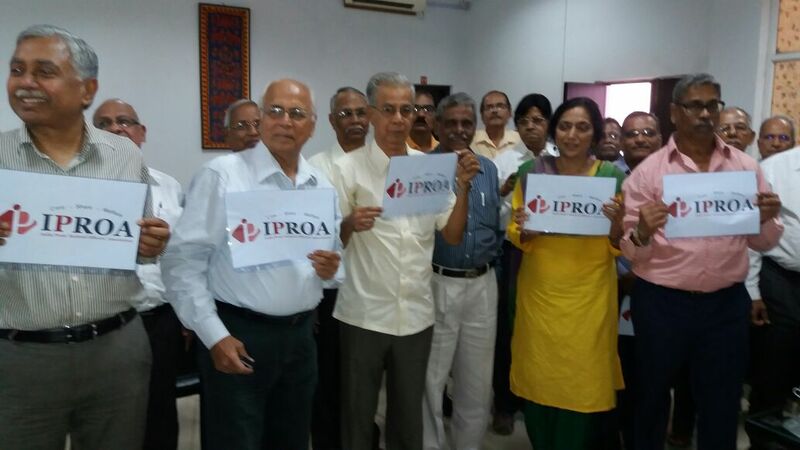 Meanwhile, there is still a chance for an increase in minimum pension of retired central government employees. The same NAC letter also asks the government employees to take up the matter with Director of Pension as the matter falls under his purview. MUMBAI: Life Insurance Corporation of India can now go ahead with its proposed Rs 1.5 lakh crore funding of the Indian Railways, with a finance ministry clarification effectively nullifying the sector regulator’s concerns and demand for sovereign guarantee for the investment. The state-run insurer had signed a memorandum of understanding two years ago to invest in the railways through bonds issued by the Indian Railway Finance Corporation (IRFC). But since this would take LIC’s exposure to more than 25% of IRFC’s net worth — it has to keep the investment within that limit in any company involved in infrastructure, debt and equity included —the insurance regulator demanded explicit government guarantee for the bonds and a gazette notification classifying these as special securities, like oil bonds. On November 23, the finance ministry issued an order, clarifying that the IRFC bonds can be treated as approved security for investment above the exposure limits. It didn’t offer any government guarantee on the bonds, but said the bonds were covered by Section 2(3) of the Insurance Act under which the repayment is charged on the revenue of the railway ministry. The railway ministry’s revenue, in turn, is backed by budgetary allocation. The charge on the central government revenue is more than a government guarantee, as it amounts to express intention of the government to pay out the obligation, whereas payment against guarantee will happen only when the guarantee is invoked, the finance ministry said. 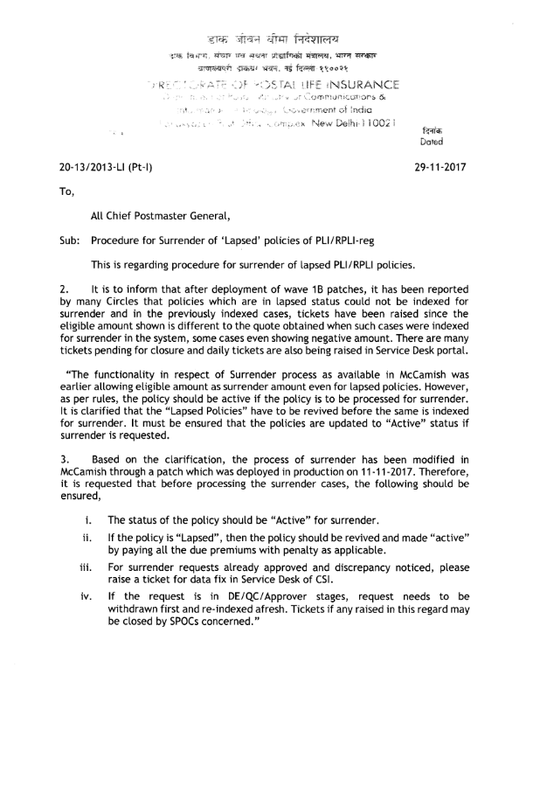 The clarification was issued after the railways, Insurance Regulatory and Development Authority of India (Irda), LIC and the finance ministry discussed last week whether this investment in the railways could be classified under approved investment category with higher limits, without any explicit government guarantee. Having LIC to invest in the bonds would reduce the cost of borrowing for the railways, at a time when the national transporter is working on ambitious projects including electrifying the entire network over the next few years. Piyush Goyal, who took charge as the railway minister in August, had said that the railways was looking at investments of nearly Rs 10 lakh crore over five years. The insurance regulator had sought special status for the bonds as it wanted to ring-fence the funds that belonged to millions of common insurers. Sovereign guarantee would also ensure the bonds’ high investment grade credit rating. At the meeting, the Railway Board was of the view that investment in the railways should come under the approved category of investment without the need for an explicit government guarantee. Under this category, an insurance company can invest up to 70% of its assets under management in instruments, including AA-rated bonds and government securities. “LIC is agreeable to the idea of the ministry of finance issuing a clarificatory order for treating IRFC bonds as approved security for additional investment by LIC in IRFC over and above the exposure limits,” a letter from the ministry of finance sent last Thursday to the participants of the meeting said. The letter, signed by T Uthaya Kumar, additional budget officer in the Department of Economic Affairs, said the government took the view of a law firm and the additional solicitor general on the matter. The ASG stated that the investment by LIC was secure as it was backed by clear budgetary allocation and IRFC bond was in the nature of approved security by virtue of charge created in favour of LIC on the revenue of the central government, it said. Kumar said Irda’s point on classifying IRFC bonds as special bonds or oil bonds was not relevant, as oil bonds issued to oil marketing companies were made marketable and investments in such instruments by insurance companies were secondary in nature. 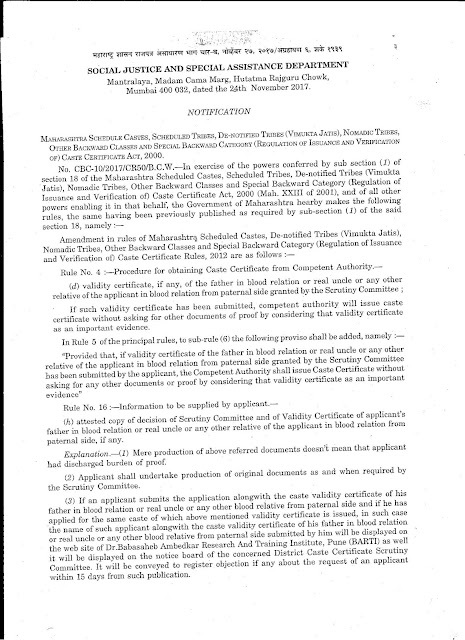 The letter said special securities to oil marketing companies were government securities and need not be defined as approved security. At the end of June 30, LIC had total assets under management of Rs 24.74 lakh crore, including equity and debt. LIC has an 80% share in the AUM of the life insurance industry. Of the total investment, Rs 5.74 lakh crore is in equities and Rs 19 lakh crore in debt, which includes central government securities, state government securities and corporate bonds. LIC has come to the rescue of the government on many occasions by investing in bonds and shares of state-owned companies.